Our Hebrew high school offers core classes and elective classes in small units. When we were approaching the new unit, the educator asked me if I would be willing to teach a knitting class. I agreed to do it on two conditions: that we were able to somehow create a class that also involved serious Jewish learning, and that there was enough interest to make it worthwhile. As it turned out, eleven students signed up for the course (including four boys! ), and I was having no trouble coming up with good topics for learning that related to both knitting and Judaism. 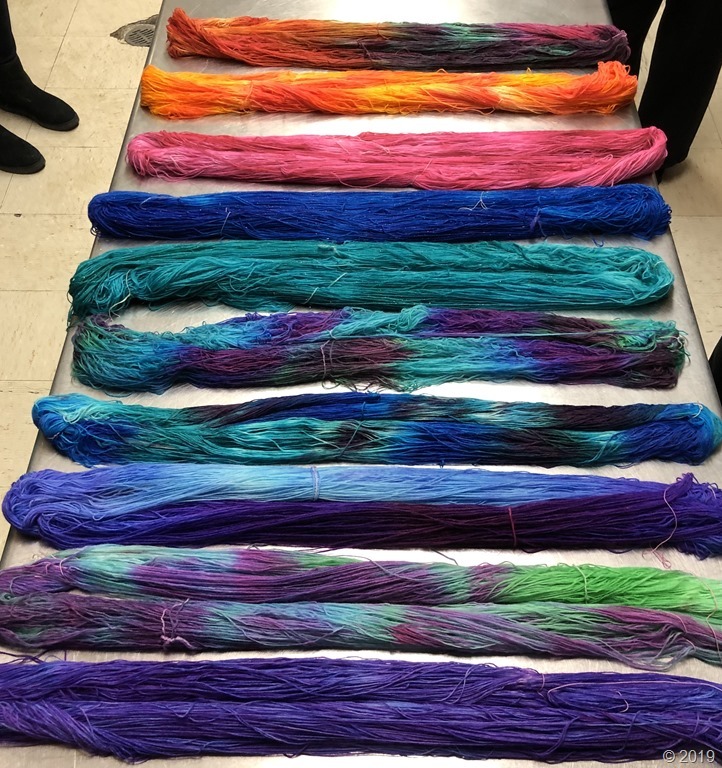 We called the class, “Knitzvah.” The course has three primary goals: To learn the craft of knitting; to complete a blanket (made in squares) to donate to the charity of their choice; and to study Jewish texts that tangentially or directly relate to the craft. All of this in a 30 minute time-slot! For our first class, the students selected the color yarn they wanted to use and learned about knitting charities. The chose, as a class, “Project Linus” to be the beneficiary of their knitting. By the second class, we had our supplies in hand, and I spent the entire class going around the room teaching the basic stitches. I handed out a text study about the 39 categories of labor that went into producing the Tabernacle. I hoped that the students would discuss how much love, skill, and craftsmanship went into the building of a holy place. The reality was however, that since this was their first day with yarn and needles and the class was only thirty minutes, the text study was largely ignored. This class was pretty much a skill-building class alone. I worried that that would be the norm, and that the class would fail as a “Jewish” course even if it succeeded as a knitting course. In planning for the third class, I realized that I needn’t have worried. The topic was keva and kavannah. Prayer takes two forms – keva, the concrete, written text of the prayers, and kavannah, the personal intention that each individual brings to the text. When we learn the Hebrew text, the keva, and know it well, we have an opportunity to get lost in the kavannah. Hebrew prayer can work as a mantra, and it actually helps if you aren’t fluent in Hebrew! If I am praying the Yotzeir prayer, for example, I know that this is a prayer about creation, nature, and light. As my mouth recites the Hebrew words, my mind and heart can meditate on their meaning. If the prayer was in English, I would be far more wedded to the actual written words of the text. After we discussed the concept in class, we talked about it how it applies to music. I sang the chorus of Jeff Klepper’s “Shalom Rav” twice. The first time I sang it, I tapped out the rhythm on my thigh and gave a clean rendition of the notes on the page with no inflection or prayerfulness. Then I sang it again, praying for peace as a I sang the words. We talked about the importance of prayerfulness. We discussed the difference between the notes on the page and a musical interpretation – kavannah. After all of that, I brought the subject to knitting. I explained that we were beginning our knitting with a swatch just for learning, but that we would discard these swatches. These are about learning the keva of knitting. Once we have all mastered the stitch, we will begin work on our blanket squares. In making these, we can add the kavannah. These blankets are for sick children. We will knit our love, caring, and our prayers for healing into the stitches. Having mastered the keva, as they have with their prayers, they will have the attention left over for kavannah. My sister had a baby recently. Her first child had been born very sick and this new pregnancy was frightening for our family as we all worried for my sister’s health and that of this new baby. I began a baby blanket almost as soon as she told me that she was pregnant. 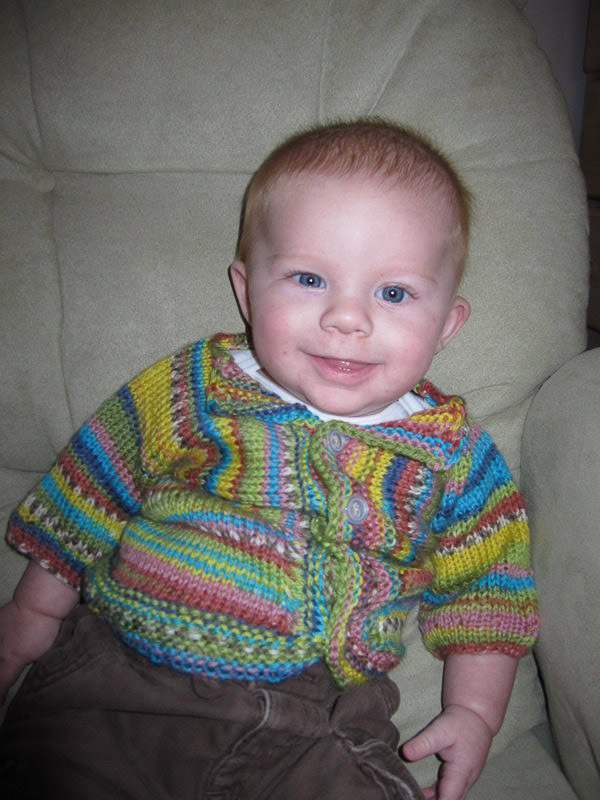 As that tiny baby developed, I knit his blanket, adding love, hopes, and prayers to every stitch. Her older daughter, now a beautiful five year old girl, still sleeps with the blanket that I knit for her. I dreamed of seeing this new, hopefully healthy baby, wrapped in the thousands of stitches that I knit for him. Charlie was born in October. He is a beautiful, healthy, happy baby. The favorite plaything of his big sister, and loves to nap on all of us. His blanket came out perfectly. I hope he can feel all the love within the stitches. This week, with Parshat Masei, we complete the reading of the book of Numbers. The parshah begins with a description of the journeys of the children of Israel as they make their way through the wilderness towards the Promised Land. The Torah recounts each stop on their path, sometimes describing the setting, or reminding the reader of something that happened in that place. An entire chapter is devoted to the brief review of these wanderings, mentioning forty-two encampments where the people stopped along their travels. The Torah alternately talks about these trips as “going forth to journey” and “journeying to go forth.” Rabbi Shimshon Rafael Hirsch suggests that the Torah’s different description of their expedition describes two contradictory attitudes of the Jews at the time. For some of them, the purpose of “going forth” was the journey itself. The Jews left Egypt as a disorganized “mixed multitude” of former slaves. By the end of their wanderings, they would be a people. For others, the point of their voyage out of Egypt was only about “going forth.” It was about ending their slavery, getting out of a bad situation, and ending up somehow free. Knitters often describe themselves as “process knitters” or “product knitters.” Process knitters enjoy the practice of knitting and the end result is less important. Product knitters do their craft because they want a particular hand-knitted item and the best way to get it is to make it. The way I am as a knitter is the opposite of the way I am in life. When it comes to knitting, I am truly a process knitter. I love the act itself and when the product doesn’t quite fit, I’m not too upset because I got my yarn’s worth out of the work that went into it. Of course, I’m thrilled when something I make comes out perfectly, but I always have my eye on that next ball of yarn. Unfortunately, I often find that when it comes to life, I am the opposite. When I want something, I want it yesterday, and I often don’t enjoy the process of getting the thing that I wanted. How I wish I could go back and repeat college or graduate school. While there, I was fully focused on grades, achievement – Phi Beta Kappa. I cared so much about product, that I often missed the point of the process. I could have learned so much more! I could have gotten additional enjoyment out of it too. There are other times in life, however, when it is not only good, but absolutely crucial to focus on product. As I watch a friend struggling with the early stages of a cancer diagnosis, for example, I know that there is little to nothing about the process to enjoy. She must focus with a vengeance on product – becoming cancer-free. The process will be miserable, painful, and often discouraging. Hopefully there will be a few moments along the way with tender and kind memories, but for the most part, I suspect, the journey will be long and painful. The key, as with most things in life is balance. On the High Holy Days, the Rabbi always shares the poem that begins, “Birth is a beginning and death a destination, but life is a journey.” Life is a journey – sometimes to and other times through, but whichever way we are going, it is so important to stop and be aware. When we are traveling to, and we must focus our eyes on our desired goal, we should try to take notice of the wildflowers along the road. If we are traveling through – we should still make sure to think about where we want to end up. It’s the only way to the Promised Land. I haven’t done a craft post in a while, and it is indeed time for one. As you know dear readers, knitting is one of my main passions in life. As a person who loves craft, I have been trying to also learn to sew. The combination of these two hobbies lead me, about a year ago, to complete a knitted and felted bag with a sewn-in fabric lining. It was pretty easy to make, took very little time, and got a LOT of compliments. Compliments that went straight to my head. Last year’s women’s seder at Temple Beth Torah included a silent auction to raise money for the Temple. I thought it would be great to donate another bag like the one I had already made, but this one would be knitted to the specifications of the winner. Good idea, right? WRONG! The person who won the bag paid a good amount of money for it, making me feel like this bag would need to be PERFECT. I was excited to get started. I should have documented in photographs the disaster that followed over the course of the next year. I knitted three different versions of this bag, each ruined in the process of attempting to line it. The lining that the winner requested was far more advanced than the one that I had made for myself (including a pocket sized for a cell phone and a zipper pocket) and the handle attachments that she wanted were different too. I was excited to learn how to incorporate these embellishments. I returned again and again to the store to buy more yarn, fabric, and bag making hardware. I know I spent more on the bag than it was worth! I ripped out attempt after attempt to make this bag work. Each effort was a tremendous learning experience in knitting, sewing, and bag making. Each time sitting at the machine was a lesson in patience and good will. As Passover approached yet again, I knew that I couldn’t allow this bag to take me OVER a year to complete. I set out with renewed vigor to finish this bag. And I did. It’s not perfect. It isn’t designed exactly the way that I had wanted. I had to admit defeat on a few things, and I am concerned about how well the bag will hold up under heavy use. But, I can honestly say I did the best that I could. Now a new problem comes… How do you let go of something that you have worked so hard to create? Goodbye dear bag! Good luck and remember – try to hold yourself together!! P.S. For this year’s silent auction I am offering – knitting lessons. Let’s leave the sewing to people who actually know how to do it! I knit for a lot of reasons, but the knitting that is the most important to me, is knitted love for those I love. When I take on those projects, I knit my feelings into every stitch. The appearance of the final product doesn’t matter much. I hope that they love it though, and that a little bit of the care gets carried on in the finished product. When R* became pregnant with her first child, I was thrilled! I immediately began work on a blue crocheted baby blanket. I was quite proud of the finished product. It was large and very warm. R thanke d me, told me that it was perfect for the stroller, but I didn’t hear much about it after that. I did know that it got passed down to the next sibling, when little brother was born. I didn’t photograph it new. This was before the days of Ravelry, and I don’t think it occurred to me to photograph it. R sent me a recent picture of it now, though. At over 7 years old, it still looks pretty good! When another beloved friend, D*, became pregnant, R asked me if I would be crocheting a blanket for her. I hadn’t planned on it. That first blanket took me forever and I felt like everyone gives blankets to new babies. I figured I’d do a sweater. But R told me that I really should do the blanket. She said she loved that blanket, that she always got comments on it, that it was the best one. 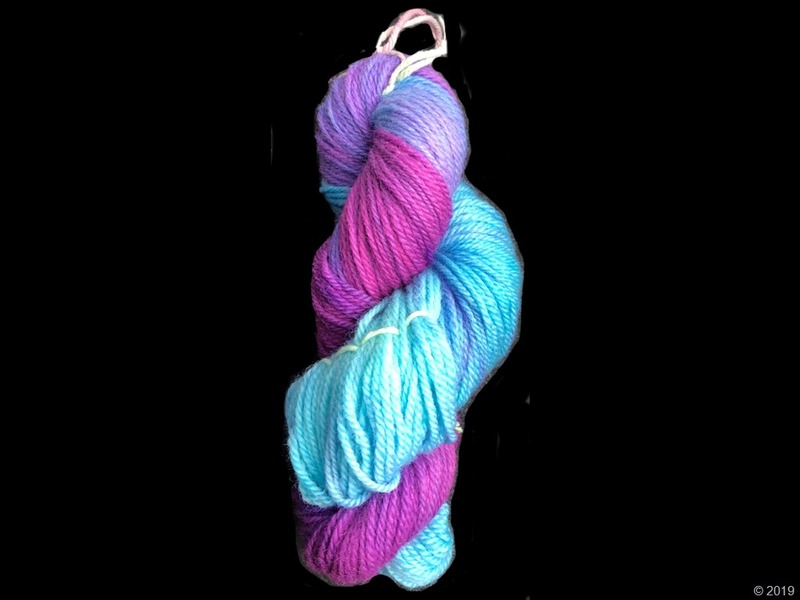 So, off to the yarn store I went! I bought yellow yarn because D didn’t want to know the gender of the baby. I decided to do the same pattern than R had liked it so much. I worked fast, but almost not fast enough. D’s baby was born premature and very, very sick. She was in the hospital for the first five months of her life. I knit furiously for her. I finished the blanket and started knitting preemie hats, socks, everything I could think of to keep this poor, tiny, desperately sick baby warm and covered in love. I have a picture of her that that D asked me to describe rather than post because it is so sad and so painful to see. In the picture, the baby is in an incubator with a nasal canula in her nose. She is tiny, sick, and swollen. At that point, we didn’t know if she was going to make it. On her head is a pink hat that I knitted for her out of precious silk yarn – the softest I could find. On top of her is that yellow blanket I had begun before she was born. When people find out that I knit, they often tell me about the aunt or grandmother in their family who knit them so many intricate things with love. Often those things were totally hideous. But, 9 times out of 10, they still exist in a closet somewhere as a concrete thing that helps them remember their loved ones. Will my creations become heirlooms? I hope so, but I won’t ever know. If they do, I would have the rare opportunity to give love to a descendant that I may never have the chance to meet. I cannot imagine anything more special. *Names and relationships hidden to protect the innocent! Yesterday I had a flight. It was about 3 hours, so I figured I would cast on with stash yarn for a sweater for my soon-to-be baby nephew. I cast on for an Elizabeth Zimmerman “Baby Surprise jacket,” but before I finished casting on, I decided I would make a cardigan instead. Same number of stitches cast on, so why not? I did a 2 by 2 rib and then decided that I wanted to do a cable sweater. I did some math in my head to figure out the cables. This is where I went horribly wrong. I spent the entire rest of the flight ripping and reknitting because I couldn’t get the math to work out. Now that I am done travelling, I have nothing to show for my work except for a few rows of ribbing. The moral of the story – an inch of planning would have been worth a yard of beautiful knitting. I have enjoyed yarn crafts for almost my entire life. For the past several years, I have become a passionate and dedicated knitter. Knitting keeps me calm in stressful meetings; it helps me stay focused on what is happening; it relaxes me after a difficult day. Knitting inspires my creativity as I think about color, design, and texture in the hopes of creating new and beautiful things. But knitting is, for me, also a deeply spiritual practice. When we knit we take something that is almost useless and turn it into something appealing and functional. The practice of knitting teaches patience. The finished object that I see in my mind’s eye is months from completion, yet stitch by stitch it gets closer. When facing a task in life that seems daunting, I remember the baby blanket that I crocheted for by niece. It was months of the same stitch in the same yarn. At first it looked so incredibly bland and boring. But when it was complete, oh when it was complete it was a work of art and, more importantly, it kept her warm in her first fragile months of life in the NICU and when she finally got to go home. Knitting also helps us learn the skill of when to give up and let go, and when it is worthwhile to go back and fix. I always loved the idea that Native Americans believe that a work of craft (usually beading, I believe) should have one error in it, a place for the spirit to move in and out of the art. I use this idea to allow me to let small mistakes go and become a part of the design, a piece of what makes the knitted object unique and handmade, as opposed to sterile and stamped out. This is an important lesson in the art of life, as well. It makes me wonder if the reason that humans are so imperfect, even though we are made in the image of G-d, is that it is our imperfection that made us G-d’s special hand-crafted art-work. A big error in our art should not be let go, however. Sometimes it is worth the effort to rip back a lot of rows of knitting to fix a large and glaring mistake. (Knitters call this “frogging” because you “riiiiiip it, riiiiiip it!”) Frogging can be a heart-wrenching activity. You watch the hours of loving work unravel in a kinked mess of yarn. What may have taken weeks to create comes out in minutes. Yet, without being willing to let it go, the finished object may not have fit, may not have been functional, may not have been beautiful. A glaring mistake in life can be even more difficult to undo. Addictions, for example, can take years to recover from, but the recovery is still a painful necessity in order to be able to move on and make something beautiful out of life. 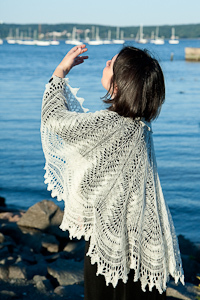 Knitting helps us envision a future more idyllic and more complete than the present. It is like the prayers at the end of the worship service. “May the time not be distant, O G-d when…” As long as we can see that perfect future when nations live at peace, we can work towards making it a reality. I’m casting on for that future right now.